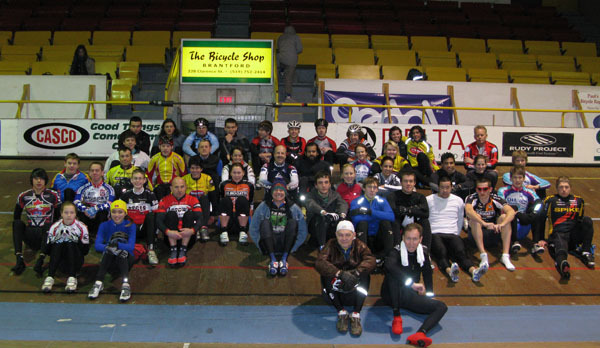 44 riders registered and attended the fourth annual Christmas Cycling Boot Camp at the Forest City Velodrome in London, Ontario. The large group included riders that have come through the FCV youth programs and are now racing in the World Cup Series…..next stop, Bejing. Joe Veloce, National Team member, was on hand to do a demonstration of leg speed. The young riders were amazed at the speed Joe achieved during a Flying lap at the Camp. The four days of hard work is in preparation for the 2010 racing season and Track Nationals in August. Riders in attendance came from the United States, Quebec and Ontario. 32 of the riders were under 19 years of age. For many of these young riders, it is their first opportunity to see what training and preparing for a race season is all about. Many of the drills were geared to reaction time, endurance, top end speed and strength. The riders also learned about bike maintenance and nutrition during the camp. The FCV would like to thank the Ontario Cycling Association and Ontario Trillium Foundation for their support of the Velodrome in London.